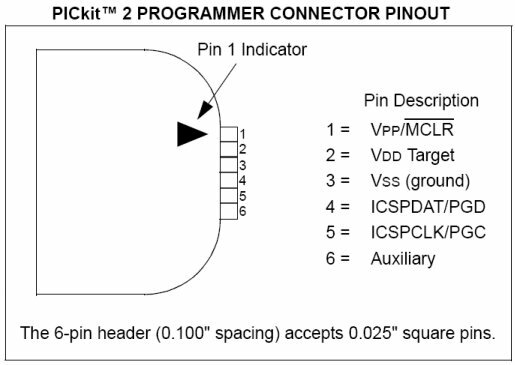 The PICkit connector is 6 pins, but the last pin is the Auxiliary pin. This pin doesn’t seem to be used that often. The setup could be simplified by snipping the 6th pin. After looking in to it, it seems the PICkit 2 is discontinued. There isn’t even a download link there for the software. I discovered it by grabbing this package, opening the PKGBUILD file. As it turns out, they still have the files on their website, they’re just not linked publicly. I’m not entirely convinced this is the latest version, but it is what I found. You can then program a hex file. Before you start, figure out the PIC chip you’re programming, the name of your hex file, and adjust this accordingly. This entry was posted on Tuesday, January 26th, 2016 at 7:08 PM	and is filed under Linux, Technobabble. You can follow any responses to this entry through the RSS 2.0 feed. Both comments and pings are currently closed.